Hello! I had a chance to play with last week's Viva la Verve sketch! This is my card for the week 3 challenge (all details here in the Verve Splitcoast forum). I needed a baby card for sweet friends of ours who are having their first baby, so I pulled out one of the new Verve releases, To the Moon. I stamped the little frame on my tilted panel and popped the little bear onto it. Since they are expecting a girl, I stamped the bow from one of the sweet bunnies in Practically Perfect (this set is currently on sale through 1/31! ), colored and cut it out, then I added it to the teddy bear. I added some flatback pink rhinestones (from Pizzazz Aplenty) to the bow, picture hanger and to the top of my card. Accessories: Rectangle and Scalloped Rectangle Nestabilities (Spellbinders), Ric Rac die (Papertrey Ink), Swiss Dots embossing folder (Provo Craft), Markers (Copic), Rhinestones (Pizzazz Aplenty), Foam tape, Thread, Sewing machine. Such a super cute card, sweet colours and lovely bear. I do like the jewelled bow tie! An adorable card...love the colors and all the sweet details, only the baby receiving this could be cuter. Stinkin' cute, Steph! LOVE the bowtie!!! hehe, this is sooo cute! Stephanie, this is SO sweet! Love his blinged up bow tie :) Darling card and great use of the sketch. Super cute card Stephanie! Love the embossed ric rac! 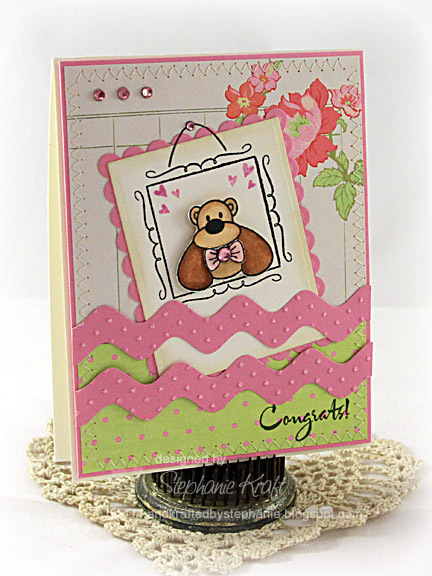 What a lovely baby card, the ric rac panels look fab, and the image is so cute! Sweet card! Love the bear he is adorable!